I consider my decision to join the 5G Protocol Stack Development group as one of the best things I've done after joining the University of Maryland. It provided countless opportunities to learn. To start off, it gave me a chance to network with a community possessing tons of industry experience and knowledge. It has been a platform for like-minded people to collaborate. This project exposed me to a wide variety of cellular technologies since the work spans 3GPP releases. I familiarized myself with different programming languages including C, C++, Python and Linux operating system, enabling me to work with larger enterprise level codebases among many other things. It also gave me hands on experience with hardware and I got to apply theoretical concepts from ENTS622 and ENTS653 courses. The motto of this project is contributing to the open source community of protocol stack development. The constant progress the team has been making is a huge motivation, pushing me to work harder and to contribute. Continuous support from the ENTS Program Office has enabled us to work effectively and Dr. Alejandra Mercado helped us with her invaluable inputs at critical junctures. The priceless discussions we had during our brainstorming sessions were not only confined to the project but encompassed both current market trends and future of the telecommunication industry. The first “Eureka!” moment was when we established communication between two USRP devices. Additionally, I went on to configure one of them as an FM Receiver and I’m working on implementing other modulation schemes. We're currently working on adding carrier aggregation to the 3GPP Release 8 protocol stack. Apart from my technical skills I got a chance to hone my interpersonal skills such as communication, time management, teamwork and leadership. I look forward to continuing to work with the fabulous team in days to come as we have exciting things lined up. To follow our progress, visit 5g.umd.edu. 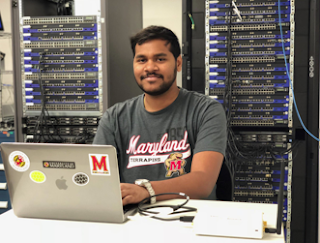 Guest article by Sharan Erukulla, who is a graduate student at the Masters in Telecommunications Program at University of Maryland. To know more about the author, visit sharanerukulla.weebly.com.